The past few years has not been a fun time for 'stock pickers'. 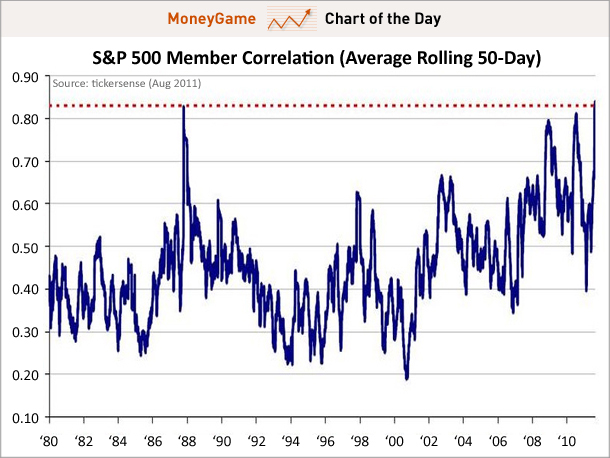 Correlations have risen to record levels, as everything has turned into a 'macro' trade much of the time. I have called this 'student body left' trading, where the herd all moves in one direction en masse. And then often times move in the exact opposite direction (of course en masse) a few weeks later. Government policy, and federal or central bank interventions mean more than individual metrics much of the time.... the 'free market' has been lost long ago. Combined with the dominance of computerized trading (now accounting from anywhere from 50-70% of all volume) and EFT trading (where the individual components are all treated as one in a buy and sell decision), and we have both structural and cyclical changes happening in the market. 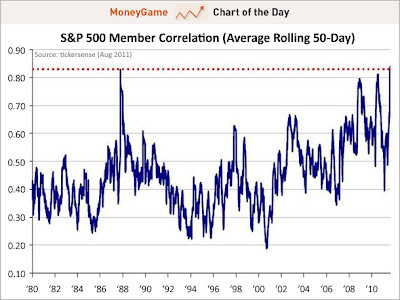 I thought 2009 and 2010 were bad, but it appears according to this chart at Business Insider, we have actually surpassed those levels of late on a 50 day moving average basis. Not surprising as we've seen the macro (Europe, hopes for interventions) dominate.